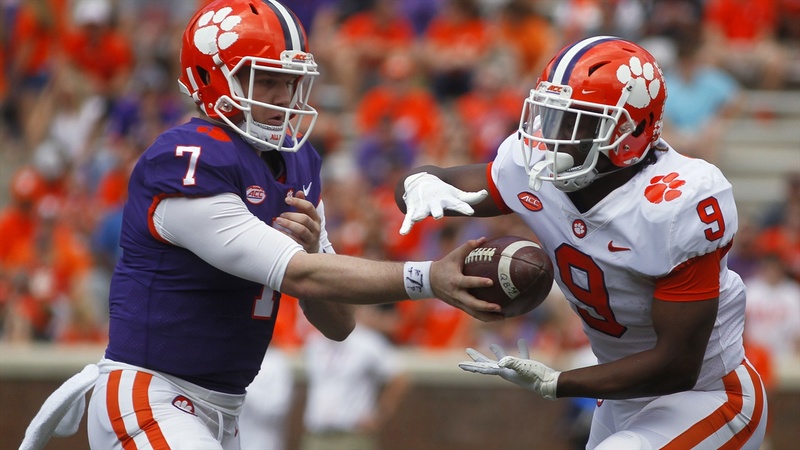 CLEMSON -- After the first few drives of Clemson’s spring game Saturday afternoon in Death Valley, you could definitely tell there were some jitters both on and off the field. A crowd of nearly 60,000 Tiger faithful were on hand as Chase Brices’s White team pulled away from and defeated Trevor Lawrence’s Orange squad, 30-10. During the contest, Justyn Ross made a play that was similar to the one he made in the National Championship getting fans on their feet. Ross jumped high into the air on a 30-yard completion over corner Derion Kendrick between two players who we’ve heard about all spring. The White’s scoring drive was capped off by a 15-yard touchdown grab by Braden Galloway to put them up 7-0 early. Trevor Lawrence and the Orange team’s first scoring drive didn’t come until the second quarter, which was highlighted by a 31-yard Joseph Ngata reception where he tiptoed the sideline. Tee Higgins made two critical catches on the drive. The first coming on 4th and 3, then on third and goal, where he and Lawrence connected for a 6-yard touchdown tying the game 7-7 in the second quarter. The defenses controlled things as Xavier Thomas and Justin Mascoll got pressure on Chase Brice and Trevor Lawrence early, but the story might have been punter Aidan Swanson. Swanson made an early impact with a 47-yard punt that landed near the 10-yard line, gaining the approval of the Death Valley crowd which can help him in pushing Will Spiers for the starting role. Swanson looked good during his first game in Death Valley. Back to Ngata, he also added a 70-yard catch and run from Lawrence in the fourth quarter. Ngata’s fellow freshman wideout Frank Ladson made his presence felt in Death Valley with a 42-yard catch on what appeared to be a busted coverage in the second quarter. The way Ladson runs his routes will make him a viable weapon for the Tigers in 2019. Watch out for that combo this season. The defensive was rallying to the ball, throughout the contest and including a fumble that was forced by freshman cornerback Sheridan Jones near the end of the first half, leading to a 9-yard Darien Rencher touchdown to give the White team a 17-10 lead at the half. Jones would also end the scoring for the day with a 42-yard interception return for a touchdown in the final minutes of action to cap the scoring. The second half provided more opportunities for reserves to get some action, including Taisun Phommachanh who completed a 25-yard throw to Justyn Ross in the third quarter, which lead to a Stephen Sawicki field goal, one of two in the second half to close the scoring. Phommachanh looked fluid in the pocket and has a lot of potential moving forward given his speed in the open field. Clemson opens the 2019 season on Thursday, Aug. 29 in Death Valley against Georgia Tech.